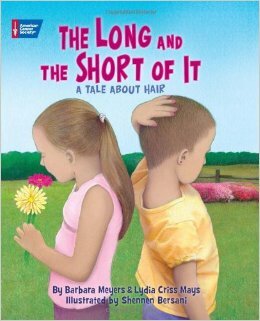 The Long and Short Of It is very inspiring for girls with long hair to give to girls with no hair. Isabel wanted to grow her hair long just like her cousins but Emma wanted hair period long or short brown or blond she lost her hair in a cancer treatment which happens to lots of girls and boys. Isabel decided to give her hair away she sent it in and like magic Emma had hair again. Now she felt like she fit in . We should all give to people with cancer to make them feel good .